Vous pourrez profiter pleinement celui-ci d'un genre décorateurs montrent maison sur un budget! Trois salles de bain complètes. Animaux acceptés - petits animaux, bien formés, bien entretenues acceptés avec accord préalable. We checked out today from a great week at this townhouse! Plenty of room for three families and lots of privacy. My friendly suggestions would be to add a place to rinse sand off after the beach, the beds could use a memory foam topper, and the couch in the master would be perfect if it made a bed! We LOVED how close it was to the beach and sweet Carl. He made sure we had our spot daily. We also loved being able to bring our dog! We would absolutely rent again. The outside view of the condo was great! After entering we had the same impression until we settled down. There was much needed attention to many areas. The house keepers need to spend time cleaning the condo. We paid for a clean place to stay. When we pulled out the sofa sleeper it wasn’t cleaned, the beds on the main level were not clean, there was blood spots on the pillows and stains on the spread. Before we could sleep in the beds I had to wash them. The stair rails was dirty or needed painting. The curtain rod on the second level had been torn of the wall, some of the furniture had water stains which damaged it. The water heaters was not sufficient for our group we had to wait to take showers or take a cold shower. If I wasn’t locked in I would have left and looked for another place to stay. Also, some of the TV’s need up dating, the dishwasher, the washer and dryer and the AC unit needs some attention. The property manager was very helpful, when called about the problems, they showed up immediately and was very upset about our concerns. If they had known about our bedding problems they would have attended to them the 1st evening of our stay. We called early the next morning. Overall, the property was in a good location and worked for us. But, I will look for another property to stay when I return. We are sorry that you were not pleased with the property. We also were not pleased with the quality of the housekeeping and have replaced the housekeeper. The maintenance issues with the drapes and AC were immediately repaired. Most of our guests have been happy with the property, the proximity to the beach and the ability to accommodate a large family. We work hard to provide wonderful properties for our guests. Feedback from our guests is always appreciated and we respond accordingly. The house was better than expected. The house was really nice. Only two things that can be improved would be a cleaner pool and the couch that becomes a bed, in the living, was not comfortable. Needs to be replaced. Loved that is was a short walk to the beach and the house accomdated my whole family. 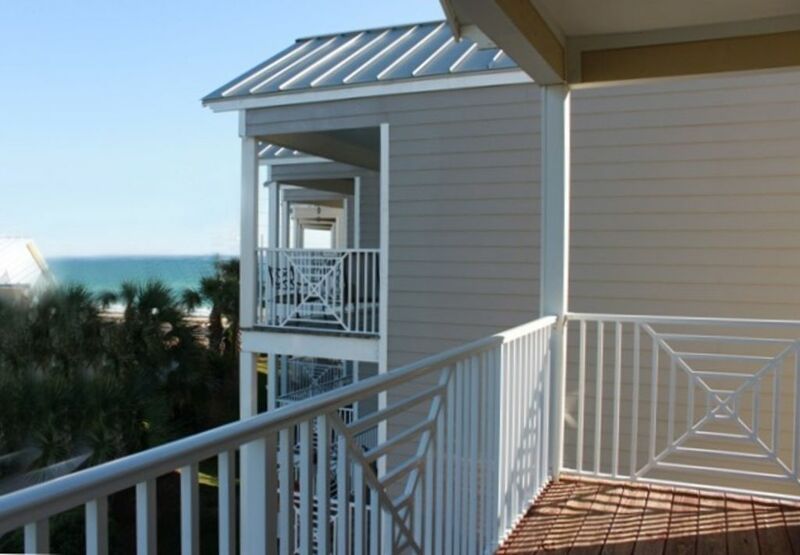 Beach Pointe 302 is a wonderful property. Will absolutely rent again. First time to visit Destin for us and we truly loved it. We are beach lovers and spent most days either on the beach or at the town home. There were 12 of us with the youngest being 15. We did use 2 air mattresses that we brought, but wouldn’t have needed them with younger kids. The kitchen is well stocked with utensils. The bathrooms are nice. The walkouts on each level make that morning cup of coffee even more enjoyable. The only inconvenience we felt all week was the apartment size washer and dryer. However there are plenty of bath towels provided and we did manage to launder most our clothes. We did not try to wash and dry our beach towels... Hang them on the balcony rails like we did and you will be fine. The beach is great! There are several others you will share it with but it is not crowded as compared to some of the large hotel beaches. Did I mention, the beach is great? Your 2 chairs and umbrella that are provided will be set each morning by Carl. If you see him tell him the Wathen’s said hello. This property is within walking distance of the beach. The spacious main floor kitchen and living area is nice as well as the small bedroom with comfortable bunk beds. The master suite is comfortable and quite large with a kitchenette and living area. The other bedroom has two beds but unfortunately those beds are extremely uncomfortable. The laundry area is quite small. You cannot do a full load of laundry. We enjoyed our stay but unfortunately the rental manager was unprofessional and behaved in an inappropriate manner. This home is wonderful for a vacation and so close to the beach. This guest and her family were here for 3 ½ months awaiting the completion of their home nearby. When their home was completed earlier than expected, they wanted a refund. No complaints were made about any aspect of this townhouse until this review after their departure. We have never had any complaints about the comfort of the bedding. The washer/dryer is a small laundry center and will only wash small loads. We have had many happy guests over the past 12 years of managing vacation properties here in the Destin and Miramar Beach area and dissatisfaction is a rare occurrence. La carte google ci-dessus n'affiche pas l'emplacement avec précision. Beach Pointe 302 est à 75 mètres de la plage près du restaurant Captain Dave's le long de Scenic Gulf Drive dans la région de Destin / Miramar Beach.